There are a lot of jambalaya recipes floating around the internet. Just how many of them are authentic is anybody’s guess. The way I figure it, for a jambalaya recipe to be the real deal, it must be from someone with ties to Louisiana. The one I’m going to share with you today is just that. It comes from an old friend and colleague, the late Sue Ellyn Scaletta. Susie was awful proud of her jambalaya, which she often shared with her co-workers at the Grand Forks Herald. Along with her red beans, it was a testament to her Louisiana roots. I had Susie’s recipe at one time but over the years seemed to have misplaced it. It wasn’t until a recent get-together with some former Herald newsroom employees at the home of Naomi Dunavan that I was reacquainted with the Cajun classic. When Susie was fondly recalled, Naomi and another co-worker, Ann Bailey, said they had the aforementioned jambalaya recipe. I asked Naomi if she could make me a copy of the recipe, and she reciprocated. Almost immediately, I made up my mind that I was going to make some jambalaya for supper. So, on my way home, I stopped by our local supermarket and purchased some shrimp and bell peppers. I had the rest of the ingredients, including a pound of andouille sausage, on hand. 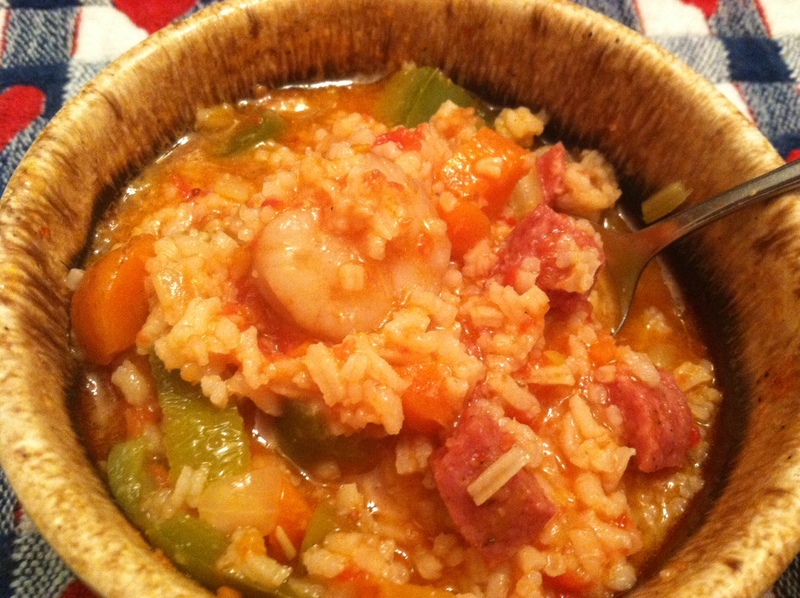 The result exceeded my expectations and although the jambalaya may not have been quite as good as Susie’s, it surely was better than anything I could have created from a Web recipe. And it gave me a warm, fuzzy feeling knowing that Susie would have approved. Chop vegetables, setting aside half of the onions and peppers. Saute other vegetables in 2 tablespoons olive oil in a large pot until tender. Add chicken broth, water, rice and 1 can tomatoes after chopping them in a blender. Add seasoning salt, garlic and at least 1 teaspoon of cayenne pepper. Bring to a boil, then put lid tightly on pot, turn down heat and steam for 20 to 30 minutes or until rice is done and liquid has cooked away. Boil water seasoned with prepackaged shrimp boil seasoning. Only leave shrimp in the water until they turn pink. Drain and set aside. Brown sausage that has been cut into small pieces in a frying pan. Set aside. In another pot, saute the set-aside onions and peppers in olive oil. Add the second can of tomatoes that also have been chopped in blender. Season with cayenne pepper, seasoning salt and about 1 teaspoon sugar. Add the cooked shrimp and sausage to the cooked vegetables and cook slowly for about 5 minutes then mix thoroughly with vegetable/rice mixture. TOM DAVIES: The Verdict — Pull Your Head Out Of Your Grass! Nice Tiede – so glad you found a photo of Susie to include with her recipe.